Checking out a range of cake decorating pictures can illustrate not only basic decorating techniques, but also the wide range of applications of those techniques and how they can create beautiful and delicious desserts. 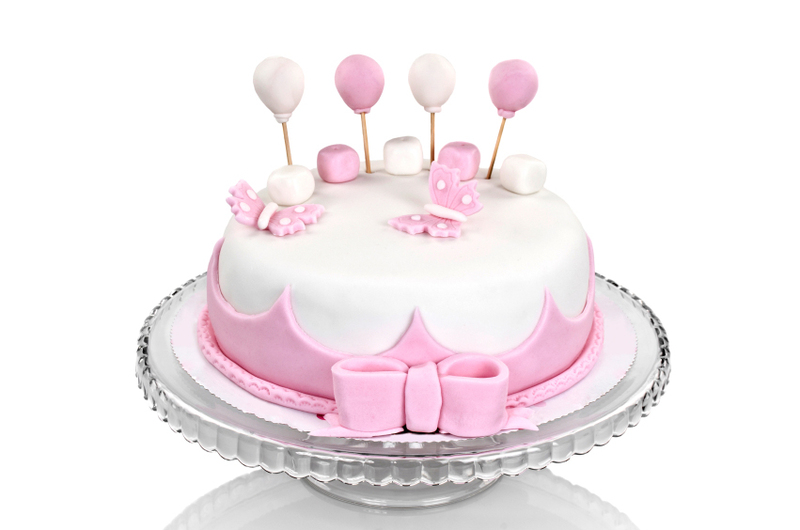 With the right tools and plenty of practice, you can create scrumptious cakes for any occasion. Classic buttercream roses are one of the most basic cake accents. Two-toned roses and leaves are more challenging to create but add depth and beauty to the cake design. Stenciling a cake is a great way for even decorating amateurs to achieve professional, elegant results. Delicate stencils work best on fondant icing, though simple stencils can work well on any type of cake. Piping scrollwork onto a cake is another basic decorating technique that will take practice to perfect. Dots, monograms, scrolls, and vines are all great applications of this technique, frequently used on wedding cakes and elaborate desserts. Cupcakes are great for cake decorating practice. They give you many chances to perfect your technique, so if one cupcake doesn’t turn out quite right the whole cake is not compromised. Berries are delicious and useful decorating accents for summer cakes. Use blueberries and raspberries or strawberries to create a flag cake. A more decadent berries and chocolate cake design is always a winner. Be sure the berries are clean, fresh, and similar in size for the best effect. Use simple cake decorating techniques, such as creating small stars or rosettes, for larger projects, such as an alligator or other creature cake. This is a great choice for a children’s cake and will be especially popular with frosting-lovers. Not all cake decorations need to be edible, and ribbons are often used to decorate square cakes like gift packages. More advanced cake decorators may create edible fondant ribbons as well. Flowers are a popular cake accent and can be created in many ways. Small icing stars can be layered together for larger flowers that are easy for novice bakers to master, while buttercream roses are the next step up. The most advanced type of flower is an edible fondant or gum paste flower, many of which are so delicate and detailed that they look exquisitely real. Glaze can be used to add a burst of color and flavor to fruity cakes. Popular as a summer alternative to heavier icings, glaze is most frequently paired with fruit decorations. For chocolate lovers, a chocolate drizzle or glaze is also an option. Candy pieces and sprinkles are some of the simplest, easiest cake decorations available and are sure to be a pleasure for children’s cakes. Simple candy decorations are also great for quick cakes, or arrange candies in patterns, shapes, and designs for more elegant cakes. The interior of a cake can be decorated as well. Rainbow dyed cakes are a bold surprise when cut, and other options include mixing candy pieces or sprinkles into the cake batter or using colored icing between cake layers. Some real flowers are edible and can be used to decorate fresh summer cakes. Sugared or glazed flowers are particularly popular and tasty. Chocolate curls, shavings, and chunks are popular on decorated cakes. Pair them with fresh fruit and a sprinkling of powdered sugar for colorful and delicious contrasts. Wedding cakes are some of the most elaborately decorated confections available and often use multiple advanced decorating techniques to create. Visit a bakery to see the latest cake decorating trends or ask for a demonstration of advanced techniques. Many bakeries also offer cake decorating classes that frequently include wedding cake techniques. Even an elaborately decorated cake doesn’t look as attractive when cut and served, and presentation of the dessert is just as important as how it is decorated. Add a swirl of chocolate sauce or fruit puree to the plate with other accents such as fresh berries or mint leaves for a beautiful finishing touch. Interested in more cake decorating pictures? Check out this Gallery of Cake Designs for more sweet inspiration.